A shorter, published version is here on the Guardian website. Those of a certain age may remember the opening ceremony of the LA Olympics in 1984. As Rafer Johnson lit the eternal flame, a man strapped into a rocket-propelled backpack launched himself across the arena above the tickertape and balloons, landing gracefully on the track before a TV audience of 2.5 billion. It was a moment of triumph; seeming to herald a new age in which, finally, teased for decades by Buck Rogers’ “degravity belt”, and King of the Rocketmen, we’d all soon be fizzing off to work with our own personal jetpacks. Even Isaac Azimov confidently predicted that by the turn of the century, they would be “as common as a bicycle”. So what happened? In 2018, shouldn’t we all be flying to work? After all, “rocketmen” were not entirely the work of fiction. Russian pilot Aleksandr Andreyev had been working on one as early as 1919. Years later, the Nazi’s Skystormer project aimed to allow infantry to leapfrog over minefields. After the war, the US imported German rocket whiz Werner Von Braun to work on rocket propulsion, including a “jet vest” for the US army in Alabama. This later reemerged as project Grasshopper, with the aim of building a “jump belt”. All these fizzled out for lack of funds. It wasn’t until 1960 that engineer Wendell Moore’s Bell Rocket Belt that the world witnessed a working jet pack – using a turbo jet rather than a rocket. The US military commissioned Moore and John Hulbert, a specialist in gas turbines, to work on the Jet Belt or “man rocket” for possible military use. Moore’s first problem was fuel. Any fuel capable of producing enough thrust burned up in a flash. Moore hit upon using hydrogen peroxide, a compound commonly used as bleach, as a fuel. Two cylinders were attached to a fibreglass frame with another of nitrogen gas (H2O2). Forced on to a catalyst, this mix explodes into superheated steam, which through twin nozzles, provides thrust. At 700C, it the pilot had to wear a highly insulated jumpsuit. A second snag they discovered was the human body’s natural resistance to aerial navigation, not having evolved to fly. These limitations made the device strikingly tricky to stabilise, using directional thrusters controlled by hand-operated levers. Undaunted, Moore flew the first 20 (tethered) flights himself, but on February 1961, the belt swerved alarmingly like an unattended firehose, snapped its tether, and Moore fell 8 feet, breaking his kneecap. Yet, after 36 tethered flights in a hangar, the untethered belt, the size of a large trunk, was finally tested outside, this time flown by Harold ‘Hal’ Graham, a 27-year-old Bell test engineer with no previous flight experience. Amid a cacophony of steam, Hal Graham flew for 13 seconds, covering 112 feet at an altitude of 18 inches. Yet it was enough to show off publicly. At Fort Eustis, Virginia, on 8 June 1961 Graham lifted himself to around 15 feet, dangled around for 15 seconds and landed admirably, offering a salute. It was a a big hit with the public. Hal piloted the device all around the world to great acclaim, but after landing on his head from 22 feet at a demo in Florida, he retired. His handed over to his friend Bill Suitor, who proved adept at flying the machine. Again, the public loved it. But the US army, who was paying for it, was disappointed. The belt required a platoon of service personnel to attend it. It required 19 litres of expensive hydrogen peroxide during its 30-second flight. It was complex to maintain and, at 125lb with fuel, as heavy as a pregnant ewe. Plus it was just so damn difficult to fly, and flew neither high or low enough to be at a safe height. In the opinion of the military, the Bell Rocket Belt was more a spectacular toy than an effective means of transport. The military withdrew funding. But the idea had caught on, and a jetpack enthusiast and engineer Nelson Tyler, approached Suitor an offer to fly his own belt. Tyler’s belt was capable of flying 140ft for 30 seconds. Suitor flew the Tyler belt to much acclaim at expos across the US, culminating in that triumph at the Olympics. Stunt pilot Kinnie Gibson was next to fly the belt, and he made himself a millionaire flying as the Rocketman until his passing – from natural causes – in 2015. Yet Gibson’s success is partly why you haven’t come to work on a rocketpack this morning. By 1990 the 90% pure oxygen he needed was becoming too expensive. And so Gibson tried his engines with 88% oxygen and a catalyst to compensate. The pack eventually malfunctioned and Gibson smashed his knee. He then sued the chemical company for the malfunction – and won. And now those companies won’t make the 90% oxygen you’ll need for that homebuilt rocketbelt. Brad Barker was Kinnie Gibson’s childhood pal; a talented mechanic and sometime Houston insurance salesman who had always been obsessed with rocket belts. Brad, a fiery character, was convinced that the rocketbelt had a commercial future. Brad divorced his wife and headed out west to work on Gibson’s machine, while setting up a new venture with entrepreneur Larry Stanley, car audio dealer Joe Wright and professional inventor Doug Malewicki. The relationship soured somewhat when Stanley stole the jetpack and a light aircraft from Barker, having previously conned 50,000 from Gibson. The business relationship then took a further unprofessional turn when Barker, accused of skimming cash, smashed Stanley’s forehead with a pistol, breaking his hand. A later fight in which Brad smashed Larry 10 times in the back of the head with a lump hammer, and Larry’s hired henchman severed Brad’s ring finger at the knuckle, put further strain on the business. Bloodied up and down, the pair concluded in a jail cell that the partnership was probably over. But Brad and Joe were convinced their fortunes lay in that rocketbelt. They had a working jetpack, even if Bill Suitor refused to fly it. So Brad stole the rocketbelt. Larry sued, and teamed up with a now-bankrupt Wright, to find the device. Within a week, Joe Wright was found bludgeoned to death on the floor at home so badly that the coroner at the scene was unable to determine whether it was a man or a woman. Brad, the main suspect, was not convicted through lack of evidence. But Larry’s lawsuit for possession of the belt, wins him 10m dollars and total ownership of the device. Brad refused to budge. Later, an impoverished Brad broke bail, lured to LA for a stuntman job, where his contacts promptly tied him up at gunpoint, interrogate him as to the whereabouts of the jetpack, and put him in a wooden box 3ft high by 4 wide for 8 days. He was forced to sign possession orders giving up ownership of the belt. Larry appears behind a door to take control of the papers. At trial the judge deems Larry Stanley so dangerously obsessed with the rocket belt gives him life plus 10. ‘Your honour’, Larry says; “ I was just trying to be persuasive”. Despite further court hearings, Brad never relinquished the belt. To this day , no one knows who killed Joe Wright, and no one knows where the jetpack is. 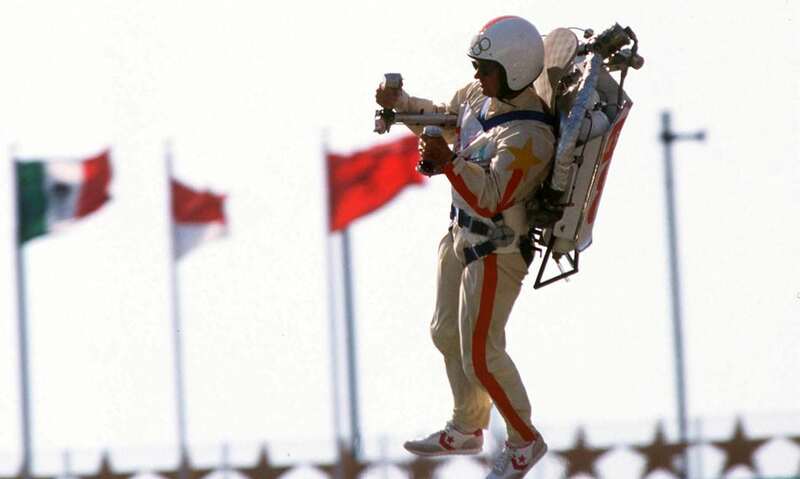 Now of course, jetpacks have become a reality again, if not the personal backpack we thought we’d all be dangling about on. Those water-propelled Hydrolift/Jetlev devices are becoming a commonplace exotic seaside pursuit, while jetpack enthusiasts build untethered versions for themselves, usually similar to the designs of Wendell Moore at Bell. The big difficulty here is still the scarcity of H2O2. Even Google has investigated their possibility. Inventor, tech whiz and head of Google‘s research laboratory Google X, Astro Teller, says Google has looked into jetpacks, but at a quarter mile a gallon and a motor as loud as a Harley, decided they weren’t practical. More hopeful is the offering from Jetpack Aviation, who specialise on personal Vertical takeoff and landing devices. They demoed their JB10 in Monaco and in London in October last year to some acclaim. It can give you a full 10 minutes aloft and looks relatively stable. The brain power behind it? One Nelson Tyler. You can have a go at one of their JetPack Top Gun centres across Britain. The company aims to release and electric version in 2019 … all yours for 200 grand. Then there’s Swiss ex-military and commercial pilot Yves “JetMan ” Rossy, whose slightly different approach essentially transforms the human body into a plane. Rossy’s contraption has two 8ft carbon wings attached to four small kerosene jet engines. Online footage shows Rossy confidently exaecuting loop-the-loops and roaring over the Grand Canyon strapped into his device. Drawback: one must throw oneself out of a plane, which makes for a rather awkward commute. Cost: 190k. Finnish pilot Visa Parviainen had a similar idea he showed off in 2005, wearing a wingsuit and two small jets to his feet like Iron Man. Perhaps the most promising development – and already on the market – is that made by Tecnologia Aeroespacial Mexicana. They’ve already sold four of their Tecaeromex Rocket Belt, and they’re also developing a helicopter version. You can train to use one using the a JetLev. *A full and funny account of all this is The Rocketbelt Caper by Paul Brown. Next Holograms: are they still the preserve of science fiction?